Cakes can be steamed as well as baked, resulting in a light, tender cake that is very moist and has fewer crumbs than a baked cake. Some traditional Western steamed cakes include fruitcake and plum pudding as well as quick breads like Boston brown bread, while Asian cultures enjoy a sponge cake cooked in a bamboo steamer over simmering water. 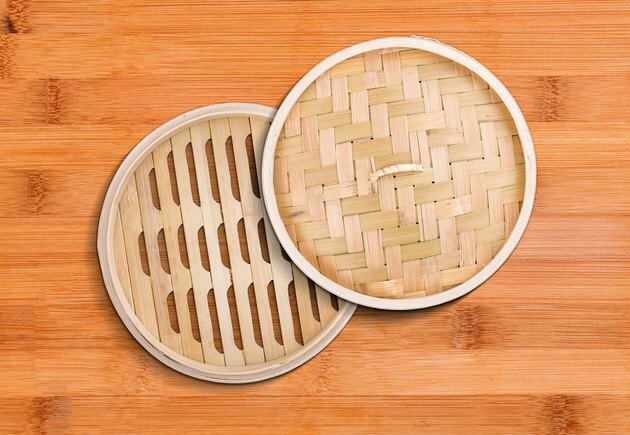 To steam a cake, you will need a bamboo steamer large enough to hold the cake pan, and a wok or similarly wide pan. The steamer must be covered while the cake cooks so that heat surrounds the entire cake. Line the bottom of the cake pan with parchment paper. Add water to the wok and place it over a burner set to high heat. Bring the water in the wok to a full boil, then turn down the heat to low. Sift the cake flour and measure out 1 cup of the sifted flour. Combine the cake flour with the baking powder and salt in a small mixing bowl. Separate the eggs and combine the egg yolks and sugar in a separate bowl. Beat the eggs and sugar with the mixer until the egg yolks have tripled in volume and the mixture forms a ribbon on the batter's surface when you lift the beater out of the bowl. Gently stir in the almond extract. Sift the dry ingredients over the egg yolks and fold them in gently with a spatula. Whip the egg whites and cream of tartar in a clean bowl until they are glossy and form stiff but not dry peaks. Fold the egg whites into the yolk mixture. Pour the cake batter into the cake pan. Turn up the heat under the wok to bring the water to a boil. Turn the heat down to medium and place the cake pan in the bamboo steamer over the simmering water. Cover and steam the pan for 20 to 25 minutes or until a toothpick inserted into the cake's middle comes out clean. Invert the cake onto a plate and remove the parchment paper. Use vanilla instead of almond extract or omit the almond extract altogether if desired. Use 3/4 cup sugar and add 1 tbsp. strong honey to add a different flavor to the cake. Add lemon or orange zest instead of almond extract. If there is room, cover the steamer with a towel and put the lid over the towel. It will prevent water from dripping into the cake. Serve the cake with fruit and whipped cream.